Your boat’s engine will need a reliable marine battery. Your marine battery will start your engine and power your accessories. There is a wide array of batteries for boats, from batteries designed to be used with trolling motors to those used to crank up and start the boat’s engine. With the many options available in the market, it can become difficult to figure out the best marine battery for your boat and needs Today we’ll be covering the Best Marine Battery alongside important aspects helping you to pick the best marine battery. What is the difference between Marine Batteries and Car Batteries? Marine and car batteries share lots of similarities, but they are inherently different. Batteries are designed to store energy not create energy. Car batteries are engineered to start the car’s engine. They supply a high amount of energy when starting the vehicle and then recharge via your car’s alternator waiting for the next time they need to start the car. Marine batteries are different in that they not only start the boat, but they can also supply energy for other purposes such as sound systems, lighting, pumps, etc. They keep the accessories that contribute to your comfort and fun while you are spending time out on the water. As such, they will continue to supply steady energy over an extended period versus a car battery that only needs to supply power in very short bursts when starting your engine. What is the battery voltage for marine batteries? What is marine battery capacity and how is it measured? What is a marine battery group size? What is the amp hour rating? What are the main types of deep cycle batteries? Why do you need have a battery box in your boat? Why do you need a charger for your marine batteries? Perhaps the most robust dual-purpose marine battery you will ever encounter is the Optima Batteries Blue Top Marine Batteries. This battery can be used where a dedicated starting battery is needed, and it will be great for powering your sound systems, lights, and other heavy electrical appliances on your boat. It boasts 1125 A Marine Cranking Amps and 750 cold cranking amps which is ideal for trolling motors. It has an impressive 155-Amp Reserve Capacity for deep cycling and again for trolling motors. The 120-minute reserve capacity gives you constant performance for all your battery needs. This is a 12 Volts battery which uses AGM Spiral-Cell Technology. Its performance is great since you can recharge it three times the number of times you can recharge normal marine batteries with no effect on reserve capacity. It has a much faster recharge time which means you won’t spend time worrying about the battery or waiting for it to charge, but you will be having fun enjoying your boating excursion. This model is designed to withstand extreme temperatures thanks to its robust plastic casing. This means it will deliver ultrahigh capabilities for deep cycle purposes in all conditions. It is also 15 times more shock absorbent; thus it provides possibilities for using it with different types of boat engines, and in choppy waters. You will like that is mountable in any orientation. Whether you have enough room or just a little space, the direction it faces should not be a problem. However, it is a large and heavy battery which can take a fair amount of space especially if you are on a small boat. 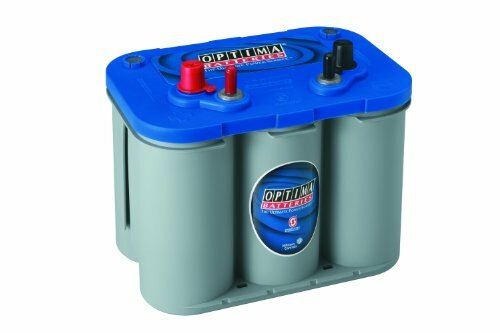 The Optima Batteries Blue Top Marine Battery is flexible, reliable, and durable. If you want high cranking power, sure-starting, and a maintenance-free marine battery, then this is the perfect battery for your boat. The Odyssey brand is renowned in the marine industry. It has proven its relevance for over a century offering us top-quality products. This particular battery is built to provide both cranking power and ultimate deep cycling. This is another 12 Volts battery which is a group 31 battery. It can meet heavy-duty applications especially when you bring equipment that needs high power. It also follows an AGM design for commercial use. It provides up to 400 deep cycles, and it can be recharged to full 100% in 6 hours of charging. This gives you a worry-free battery so you can enjoy more time on the water. This product offers 68AH rating which is great for both marine and dry land use. It will be great for high-performance boats and high-demand onboard accessories. It can be installed in any position. Since the electrolyte is absorbed in a fiberglass mat, it will not experience any spills which eliminate the risk of leakages from flammable gas or liquid acid. It comes with a self-regulation valve which comes in handy to release any excess gas to the outside. This way, you are not exposed to any harmful gases. This Odyssey model is great for all weather conditions. It provides 850 A cold cranking amps and 1500 A hot cranking amps. Whether the temperature plummets or it is scorching hot, you can always count on an Odyssey to perform with excellence. It is optimized for more recycling as it has pure lead plates. When you want longevity and dependability, and you don’t mind the premium price, the Odyssey is the way to go. It is a superior battery which fulfills specialized demands. Universal Power Group brings us yet another dual-purpose marine battery. It is a durable battery typically lasting for around around 3-5 years before needing to be replaced. It has a solid build which is both shock and acid leakage proof. The battery can be moved quickly and safely since it also has sealed containers. You will like that it will not corrode even in extreme conditions. This battery has deep cycling capabilities. With the AGM design, it gives you consistent performance that will power trolling motors and can also be used with equipment that requires a slow but steady flow of power. It charges 30-40% faster than other marine batteries in its class taking about 12 hours with a 10 amperes charger. It can also accept higher current chargers for even faster recharges. Universal Power Group makes this battery to be maintenance-free. It will not require ongoing maintenance since it does not lose water when running. With a standing self-discharge of around 3% per month, it means you don’t have to keep it in a charging state when storing your boat. You can store it for a few months then charge it when you are ready to go without losing the reserve capacity. You have a battery with a one year warranty so you can rely on the manufacturer for great service. However, if your battery gives you problems, you will receive a free battery within a 12-month period from the time of purchase. This battery is bulky. Standing at 60 pounds, you will need to be cautious when lifting it and during the installation process. 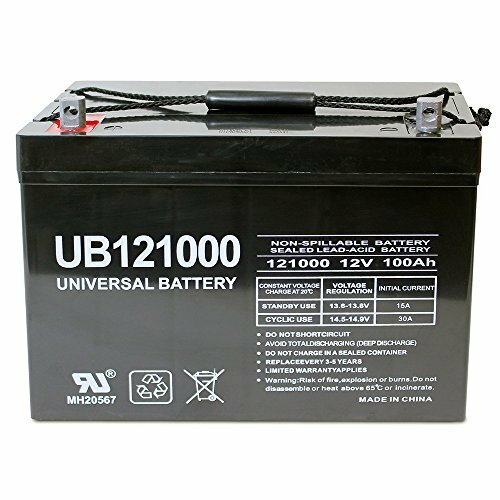 Universal Power Group offers a cheap yet very practical marine battery. It serves multiple purposes and does a great job of powering accessories on your boat as well as trolling motors. If your boat has a trolling motor, the VMAX857 might be the ideal choice for you. 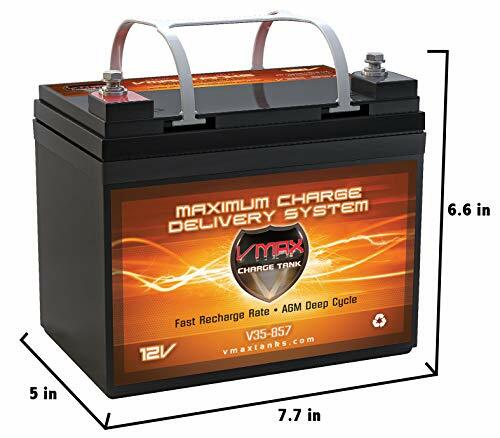 It is one of the lightweight and more affordable batteries from the VMAX line. It will be easy to lift and to also transport because of the AGM construction. With the AGM structure, this battery promises unsurpassed reliability and high performance in the most demanding situations. It is classified as non-hazardous and non-spillable since as all AGM batteries its electrolyte is absorbed by a fiberglass mat. It gives you 4-9 hours running time with a 50-60% depth of discharge. It is, therefore, ideal for trolling motors like Minn Kota, Cobra, Sevylor, and many others. It has the capacity to recover from multiple deep discharges making it a top choice for just about any application. The grid structure includes heavy-duty lead alloys and tin which increase its overall performance. It has a life of 8-10 years thanks to the tin-lead alloys making it the most durable trolling motor in its category. You won’t need to add distilled water or check specific gravity since it is virtually maintenance free. With the case being shock and vibration resistant, you are free to install it on any other equipment that needs some powering. If you have a small board where you don’t have room for large marine batteries, this model is all you ever need. It is usable in all-weather conditions, and you have a battery that will give you many years of service. Lead-acid batteries will deliver about 12.4 volts per cell for a 12-volt battery when charged fully. When they are new, they can be fully charged and equalized to 12.7 volts and can stay like that for some time before they start discharging. Discharging will vary for different batteries with regard to the weather and surrounding conditions. For example, AGM batteries will discharge at a rate of 1-3% per month. If you store the batteries in a charging state for example through AC power or solar energy, discharging should not be a problem. This is recommended when you store your boat for long periods of time without use. Most batteries will discharge quickly at high temperatures. And when they are not used for a few months, they will eventually die that’s why you need to maintain a trickle/float charge especially when storing. Capacity indicates the health of a battery. Charge/discharge/charge cycle is the most common and dependable method by which we measure the capacity of a battery. Small portable batteries can be cycled quickly, but it is not practical for large batteries for capacity measurement. The Society of Automotive Engineers states the capacity of a starter battery by the Reserve Capacity. Reserve Capacity is the time in minutes that a battery can maintain useful capacity under 25Amp discharge. If a battery has a high minute rating, it can run appliances like power pumps or lights for longer. 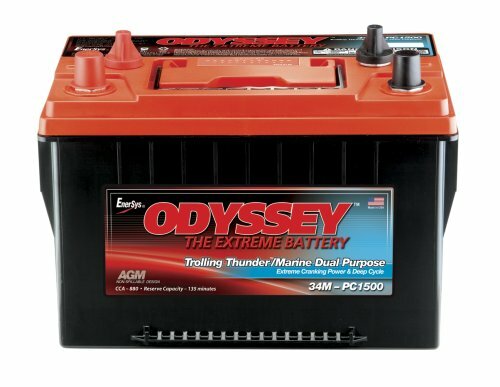 Reserve capacity is essential since you will need to consider a battery that will power your boat for extended periods. You don’t want to be stuck on the water with a battery that runs out. Apart from the discharge method, battery capacity can also be measured using the non-invasive method which checks the battery’s health in seconds via a scanning process. The size of the battery case will usually give a good idea of the capacity since the larger the case size the higher the capacity but also the more expensive the battery. Deep cycle batteries are rated in terms of amp-hours. This means an amp-hour stands for one amp for one hour. In the same way, 10 amps is 1/10 for an hour. The amp hour (AH) rating is amps x hours. If your battery pulls 20 amps and you use it for 20 minutes the amp hour rating will be 20 x 20min in hours, i.e., 20 x 0.333 hours= 6.67AH. Nearly all deep cycle batteries use the 20-hour rate. If a marine battery delivers 5amps for 20 hours will deliver 5amp x 20 hours which is 100 amp-hours. Batteries are distinguished by how they are built or by their form of application. First built for the military, these batteries are very robust. They are in the class of deep cycle batteries where the electrolyte gets absorbed in a fiberglass mat. Plates in an AGM battery are either wound in a tight spiral or lie flat like those in wet cell acid-lead batteries. AGM batteries discharge slowly partly because high temperatures don’t affect them as much as other types of batteries. AGM batteries are also maintenance free. They have inbuilt vents with gas diffusers which discharges any excess hydrogen produced in the process of charging. AGM batteries can be oriented any way you like, making them safe to transport. You can easily install one in your boat since they do not need to be kept in a sealed box that vents to the outside atmosphere as other types of batteries do. These batteries will charge very fast because of their low internal resistance. They do not need any topping with water, and they discharge deeper than any other deep cycle batteries. As such, you can leave it for months and charge it up when you need to use it, knowing that it will be ready to go. AGM batteries are vibration proofed. As such they are not affected by any vibrations from rough waters. They are, therefore, the most durable with some of them giving up to 10 years life. Also known as wet cells, flooded batteries are perhaps the oldest type of rechargeable batteries that we can still see in use today. They carry a liquid in an unsealed container which means the battery must be carried in an upright manner, unlike the AGM batteries. However, they are easy to troubleshoot, and they have high surge current. These batteries will need to be kept in a well-ventilated area to enable release of hydrogen gas during overcharging. They will require maintenance and constant topping with distilled water. These batteries are also known as Valve-Regulated Batteries. They store their electrolytes in sealed containers which have a safety valve. Oxygen at the positive combines with the hydrogen produced during overcharging. As such, they do not have any water loss. The valve is present to diffuse any excess amounts of hydrogen. These are a type of sealed batteries using a gel electrolyte. They do not need to be kept upright because the gel prevents spillage thus you will not encounter corrosion issues. They also do not experience evaporation of the electrolyte solution. They can withstand extreme temperatures, vibration, and shock. That’s why they are also preferable for boats, cars, aircraft, etc. Cold cranking amps will help you pick a deep cycle battery if you plan to go ice fishing. The CCA of a battery indicates the maximum amperage that can be removed from a battery at 00F for 30 seconds before the battery dies or drops to unusable levels. For a 550CCA battery, it means you can get 550 amperes at 00F for 30 seconds. CCA is only applicable to starting batteries. As such, it should never be confused with Marine Cranking amperage. The American Boat and Yacht Council (ABYC) requires that every boater should use a battery box as a standard measure to keep battery acid from spilling out. It serves to protect the battery and passengers from any potential dangers that could be caused by spilled acid. Deep cycle marine batteries release hydrogen gas while they are running and discharging. The battery box will act as a seal around the battery to direct the gas away. An open battery can pose dangers if kept near an engine. That’s why you will need to use a battery box for your boat or even trolling motor. Seeing that battery power in your boat is crucial for starting the engine and running other appliances, having a battery charger is essential for boat storage and making sure your batteries are fully charged when you are ready to hit the water. Battery chargers come in different types with regard to the type of battery you will be recharging. A high-power charger is useful when you want to recharge the battery quickly. The larger the size or capacity of the charger, the faster it will recharge a marine battery. For a 50AH marine battery using a 10 amp charger, it will take around 6 hours to charge the battery, but it may take up to 12 hours to recharge a 100AH marine battery. You will also need a marine battery charger for charging the battery during the off-season when you store the battery. In this case, a low-current battery charger is more appropriate as it will give low current for extended periods. Note that mismatching a charger will cause problems to your battery. If you do use an oversized charger that is too big for your battery you will damage your battery and there is even the chance of fire or explosion so pay attention to the type of batteries and battery charger you are using. Using a charger that is not powerful enough will result in your battery not charging. Choosing a good marine battery is very important to ensure you will be able to spend the most time on the water without worrying if your electronics, accessories or motor won’t start because of a dead battery. It is important that you don’t make compromises as you pick a marine battery since it will cost lots of money in the long run. In this list, we’ve given you a compilation of the best performers in the Deep Cycle Marine Battery Category. You will find multipurpose batteries and models that can only be used for deep cycling. All these brands represent dependability, high performance, and improved durability.